Want to hide your SMS and iMessages on your iPhone? This can now be done with a tweak from Cydia called LockMessages. 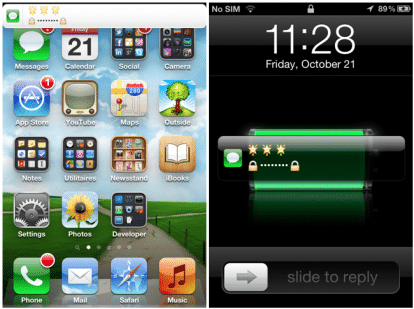 The Cydia Tweak LockMessages offers many ways to protect your messages from being seeing by others people that use your iPhone. 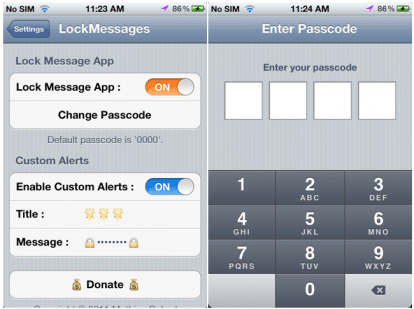 For example, it allows you to put a pass code to the Message application every time someone open it. This will prevent people from opening the Message application on your iPhone without correctly entering the pass code. The application also allows you to enable custom alerts. With LockMessages you can change the tittle and message to locked messages so it doesn’t show what the text says in the pop out notification you get when some sends you a message. You can find LockMessages in the BigBoss repo in Cydia for a price of $0.99. This tweak currently works only if you’re running iOS 5.